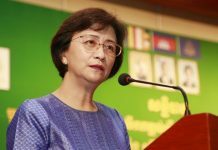 The National Human Rights Commission of Thailand on Wednesday corroborated claims that a Thai sugar company that supplied Coca-Cola has illegally taken land off of villagers in Oddar Meanchey province and violated their human rights, more than a year after the communities filed their complaint with the commission. With the aid of local NGOs, the villagers lodged their complaint with the commission in May 2013, accusing three plantations owned by Thai sugar giant Mitr Phol of stealing their farms five years ago —in some cases burning and razing their homes. They accuse the company of shooting their livestock or holding them for ransom, and of using the local police and courts to beat, harass and sue them. After a two-day visit to the affected communities this week, Thai human rights commissioner Niran Phitakwatchara said Wednesday that he backed the claims against Mitr Phol. “The concession has resulted in the illegal [taking] of land from local people, destruction of their homes, killing of livestock and shooting, beating, threat[ening] and intimidation and harass[ment] of the villagers,” he said at a press conference in Phnom Penh organized by Equitable Cambodia, one of the local NGOs helping the villagers. “In conclusion, our finding is the collapse of the community,” Mr. Niran said. Hoy Mai, one of the affected farmers, who also joined the event, said more than 600 families have lost over 10,000 hectares of farmland to the trio of plantations across five villages. “They even burned down the houses,” said Ms. Mai, who was at one point thrown in jail while she was five-months pregnant for protesting against the plantations. “Even the rice, they took our rice. They have no respect for human rights. Ms. Mai said their complaints to local authorities have all gone ignored. 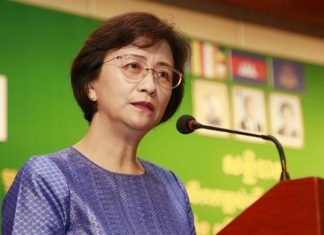 With the ruling CPP and opposition CNRP having reached a deal that saw the opposition end its yearlong boycott of its National Assembly seats, she remained hopeful that might change. “We want them to help us get our land back so we can live like before,” she said. As for the Thai Human Rights Commission, a body established by Thailand’s Constitution in 1997, Mr. Niran said the next step was to meet with Mitr Phol officials back in Bangkok. He said there were no company officials to be found when he visited the plantation this week and that the only thing he saw growing on the land, most of which was fallow, was some cassava. And while Ms. Mai said the families were glad to have his help, Mr. Niran said he had no power to sanction the firm or to file a lawsuit. What he can do, he said, is write reports, raise the case with groups like the U.N. and European Union, and try to mediate between the firm and families. “I just tell the truth and try to act as the mediator between the people and the business and make balance [and tell the company] that if you want to go on your business plan, you must [think] about the community and the people,” he said. But even that can take years. In July 2012 the commission issued preliminary findings in the case of another Thai company, Khon Kaen Sugar, accused of stealing land from families in Koh Kong province and violating their human rights. But the commission’s talks with the company have yet to yield any results for the affected families and a long-promised final report on the case has still not arrived. Mr. Niran said Wednesday that the report has only been delayed for a lack of staff and promised its arrival in October. For its part, Mitr Phol has denied any wrongdoing. In comments it sent in 2012 to the Business and Human Rights Resource Center, a U.K.-based nonprofit, Mitr Phol said it did not support encroachment on private land or destruction of private property. 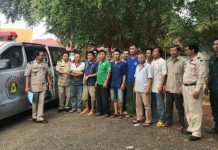 It said it had followed all applicable laws in acquiring the land in Oddar Meanchey and that unspecified “authorized officials” had consulted with local communities in advance, a claim the communities have consistently denied. The firm also claimed that the plantations have stimulated the local economy, another claim the communities deny. Late last year, amid mounting pressure from NGOs to clean up its supply chain, Coca-Cola revealed that Mitr Phol was one of its three main global sugar suppliers and announced the launch of an international investigation into the allegations of land grabbing by it and other firms. Coca-Cola sent a team to Cambodia in February to investigate its suppliers here but has yet to release its findings. Affected families and rights groups have also been asking the European Commission to cancel the free-trade benefits Cambodian sugar currently enjoys in European markets, effectively subsidizing the operations of the companies accused of stealing their land. The commissioner has rejected the request. 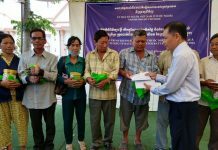 In lieu of an end to the benefits, the E.U.’s delegation to Cambodia earlier this year launched negotiations with the Cambodian government on reaching a settlement for all families with legitimate land claims who were hurt by the country’s sugarcane plantations. The two sides disagree on how many families deserve to be part of the deal, however. The E.U. on Wednesday did not reply to a request for comment on the status of the talks. Mr. Niran declined to comment on whether he supported an end to the trade benefits, claiming the matter was “political,” and out of his jurisdiction. But he did offer Prime Minister Hun Sen some advice. “I hope Mr. Hun Sen takes care [of] the people, his people, takes care of the human rights of the Cambodian people,” he said.